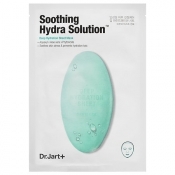 Dermask Water Jet Soothing Hydra Solutionâ„¢ is made with fine cellulose fiber to help active ingredients provide ultimate hydration. It contains aquaxyl and xylitol to enhance moisture retention and support the skin's barrier by preventing water loss. Aloe vera and phytonicdes provide cooling relief to soothe redness, blemishes, and sun burns while the formula removes impurities to keep skin looking and feeling calm and refreshed. This product is free from 10 harmful ingredients, including artificial fragrance and color, denatured alcohol, triethanolamine, sulfate-based surfactants, triclosan, mineral oil, propylene glycol, and DEA, which causes skin irritation. It is hypoallergenic and suited for all skin types including sensitive skin.